We are happy to have guest blog from Tuck Sleep Foundation share some great tips on using yoga to improve your sleep! Calming your mind after a stressful day can be difficult. Stress and anxiety can not only make it difficult to fall asleep but stay asleep. Developing a good bedtime routine that includes yoga might help relieve stress and let you get a good night’s sleep. The best part--many poses can be done from the comfort of your own bed. 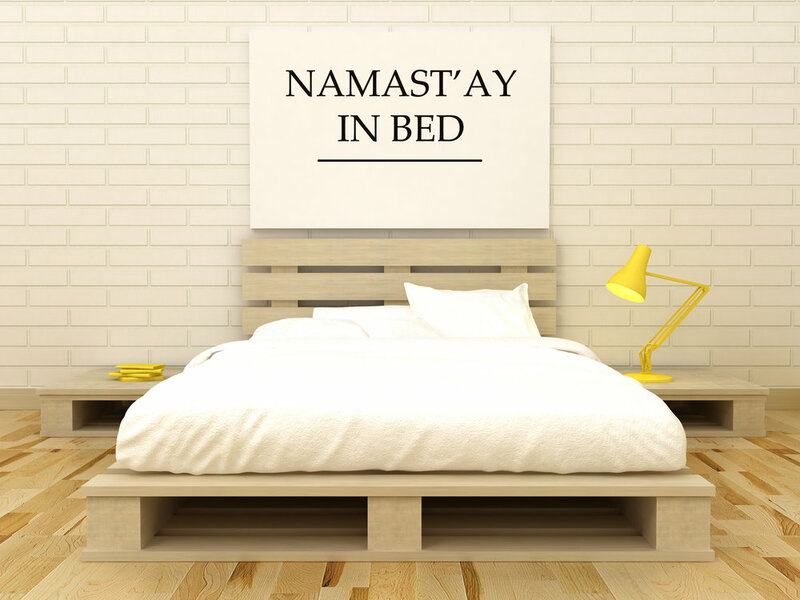 Before you start trying poses between your sheets, it’s a good idea to understand how yoga can be part of your overall sleep hygiene. Sleep hygiene includes the habits and practices you do regularly to get a good night’s rest. If you’ve got tension in your knees and hips, standing forward bend can help relax your muscles. Stand with your feet six inches apart and fold the torso to the ground from the hips. You can rest your hands on the mat or grab the opposite elbow with each hand and let your arms dangle. Seated spinal twist lengthens the muscles that get stressed from sitting at a desk all day. Sit on the floor with one leg straight in front of the body. Cross the other leg over the knee while turning the head towards the crossed leg. With the opposite hand, gently pull the knee to the chest and hold. Do the same on the opposite side. Technically, this one can be done either in or out of bed. You decide what’s most comfortable for you. While lying on your back, stretch your arms to the sides with back of the hands against the floor. Place both legs vertically against the wall. For those who spend the day on their feet, this pose sends blood back to the heart and brain, taking tension away from the feet and legs. Sit with the bottoms of your feet together. Gently bring your knees as close to the mattress as possible and breathe deeply. You should feel the tension leaving your hips and legs. If you keep your feet together and lay on your back you can also do Reclining Goddess Pose for a few breaths. This classic pose stretches the arms and back while letting the mind relax. Kneel with the top of the feet against the mattress with big toes touching. Separate the knees but no further than the width of your hips. Now, rest your chest on your legs, bringing your head to the mattress. Take a few deep, cleansing breaths before releasing. Corpse pose is the perfect way to end a bedtime yoga session. Lay flat on your back with your legs comfortably close together and arms relaxed at your sides. Once in position, focus on taking deep breaths from the diaphragm. Focus on the movement of air in and out of your body. With each breath, relax into your mattress. If you want to learn more check out the Tuck Sleep foundation website for more great resources on yoga and getting a good nights rest!